Deloitte Global predicts that 45% of global adult smartphone users in 2018 are worried they are using their phones too much at times and will try to limit their usage. 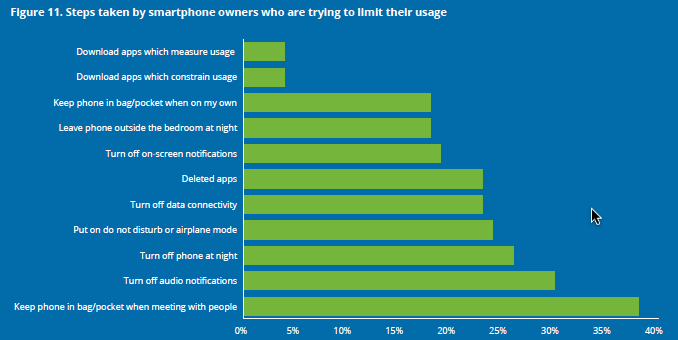 "Not addicted, but use too much"
Deloitte Global says almost half of us worry we use our phones too much, however very few of us are actually "addicted" to our devices. In fact studies show less than 3% of us. Addiction and dependence are defined medical terms, and very few adults suffer from genuine addiction to their smartphones. It is also difficult to quantify when a smartphone is "used too much". Smartphones have replaced many other devices and are now acting as watches, radio's, tvs, computers, cameras, video recorders, maps, newspapers and gaming devices... Given this reality, it is only realistic that we will use our smartphones more than we have in the past. In 2017, people with smartphones estimated they looked at their phone an average of 50 times a day. 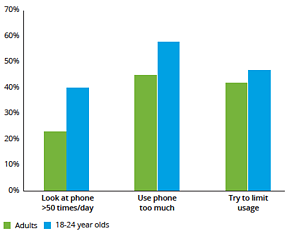 Young people and women were more likely to think they used their phones too much. English-speaking countries had very similar metrics, while users in Mexico, Turkey, Argentina and Brazil had the highest concern. Between 40-50% of Australians expressed concern. Generally we feel we are using our smartphones too much, but it only really worries us when it distracts us from certain activities. 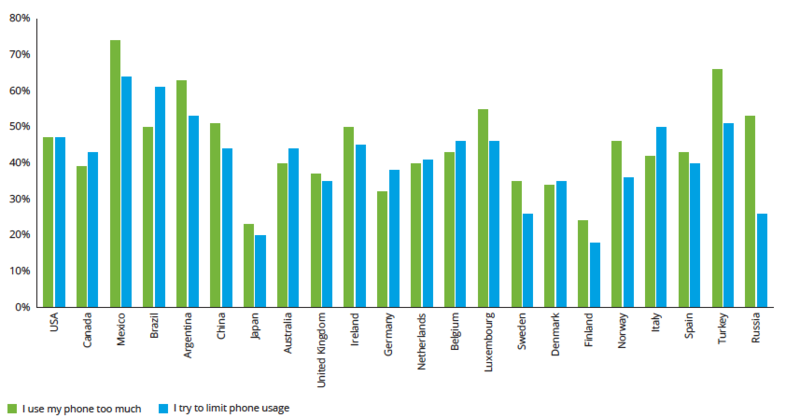 Most adults are actually quite happy with using their phones a lot - even hundreds of times per day. Instead, they are focusing on controlling usage when it is distracting them activities they would prefer to concentrate on. 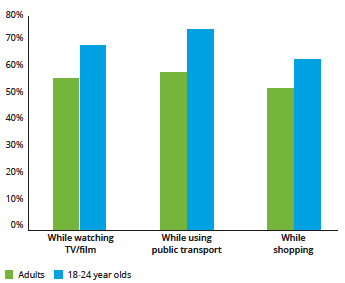 Smartphone use that was considered "not distracting" did not have harmful or negative feelings associated with it and included use while watching TV, using public transport or while shopping. In fact these activities could be enhanced by smartphone use - when interacting with TV shows, catching up on emails or news while on public transport, or comparing prices when shopping. Other smartphone behaviours are causing us to worry. We feel they are distracting us from activities we should be concentrating on, harming our relationships with others, and even potentially harming our health or endangering others. 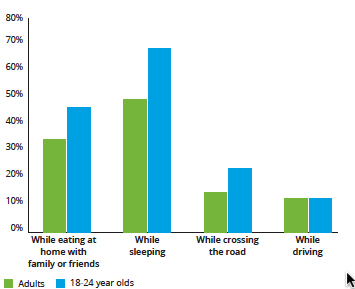 Men were more likely to use their phone while driving, 15 percent compared to 11 percent of women. But a full 60 percent of woman would interrupt their sleep to check their phone. Even though we feel we should not use our phones during some activities we are quite unsophisticated in how we limit our usage. Those who are trying to limit their use in general - rather than during a specific activity like driving - are rarely using advanced software technology, or any technology at all. Only 4 percent said they were using apps to measure or constrain their use. The most popular techniques involved turning the phone or notifications off. The single most common technique was to put the phone in a bag and ignore it. These low tech techniques seem to be working - or we think they are. 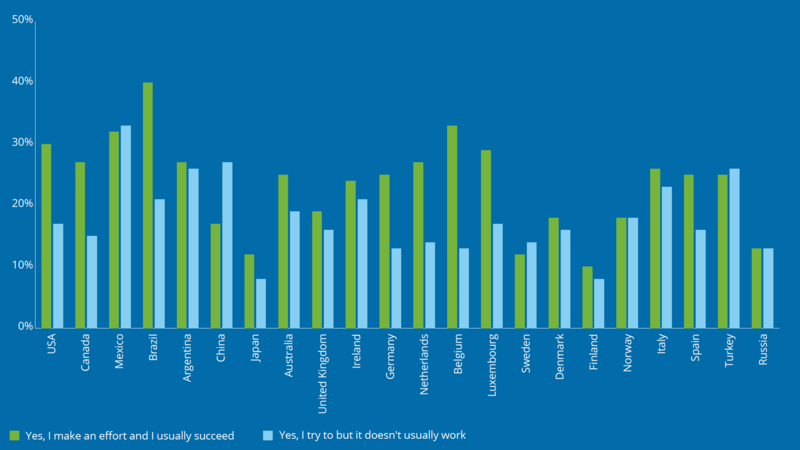 Across all countries, by five percentage points, more people on average thought they were controlling usage successfully - 23 percent compared to 18 percent. In seven countries the number of those succeeding in cutting back was ten percentage points greater than those failing with Turkey (20 percent) and Brazil (19 percent) have the most success. Meanwhile phone manufacturers are reacting to our concerns by providing the means to manage our usage on their devices. Apple has recently introduced Night Shift and Do Not Disturb While Driving. Source: The information contained in this blog is extracted from the Deloitte TNT Predictions 2018 paper.